What’s next? The answer is 8K, which is the common name for 7680x4320 resolution. 8K television broadcasting is coming to the home quickly, and many companies around the world are racing to get there first. Last month, Japanese broadcaster NHK reached a major milestone on the road to 8K-television broadcast, by successfully testing and delivering a full 8K broadcast of the Olympic Games in Rio. About 60 branch locations of NHK offered viewers the chance to experience the 8K Olympics first hand using Sharp 85inch 8K TVs in each location. There was also some Olympic-sized viewing at NHK Shibuya in Tokyo, which has a 520 inch screen and four Panasonic DLP 4K laser projectors, and supports the 22.2ch audio of 8K. 520 inches is 43.3 feet or 13.2 meters. When a projection screen gets that big, and you are only using 1080p, viewers start to notice the pixels, but with 8K, the pixels are much smaller. 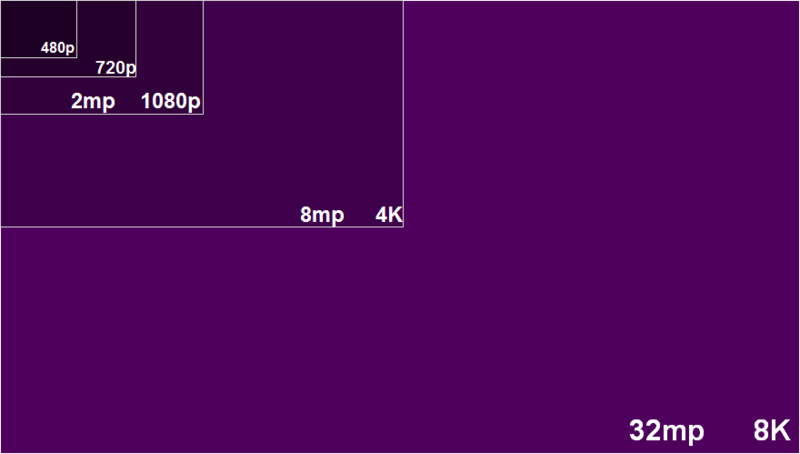 To give you some perspective on how many more pixels are in an 8K signal, check out this graphic below. You can imagine the bandwidth needed to broadcast an 8K signal over satellite. To get the data rates and bandwidth needed to transmit the signal successfully, NHK used an 8K codec system with HEVC/H.265 coding scheme. The 8K specifications allows for up to 120fps (frames per second), but 8K is not just about video, it is also about audio. In past years, the onsite audio-production facility was not designed for the 22.2 channel capability that 8k broadcast can offer, but this year a variety of microphones and special microphone trees with 8 to 12 different microphones were carefully rigged from the ceiling of the Olympic venues, providing unsurpassed surround sound audio capabilities. The recent 8K broadcasts of the Rio Olympics marked a major milestone on the road to 8K broadcasting. Just like the athletes who pushed their own limits, and who broke their own personal records, NHK set the bar higher by broadcasting the highest resolution of a live sporting event. And just like the Olympics, the road to 8K does not end in Rio. NHK hopes to replace the test broadcasts with limited direct-to-home transmissions in 2018 and full coverage of the 2020 Tokyo Olympics. Still don’t believe that 8K is the next big thing in TV? Tell me, how many pixels does your smart phone have in its screen, or camera? How many did it have 4 years ago? What about 4 years before that? Just like your mobile phone and laptop computer screens are getting better, so will television. I grew up with a black and white TV hooked up to a Commodore 64. Now my 42” 1080p LCD TV is the dinosaur and, it’s not even 10 years old. They grow up so fast! And just like your kids, that 10-year-old 1080p TV will soon move out, get a 4K degree, and eventually come back home, with live 8K television content (and maybe some laundry). Click here to learn more about MHL.